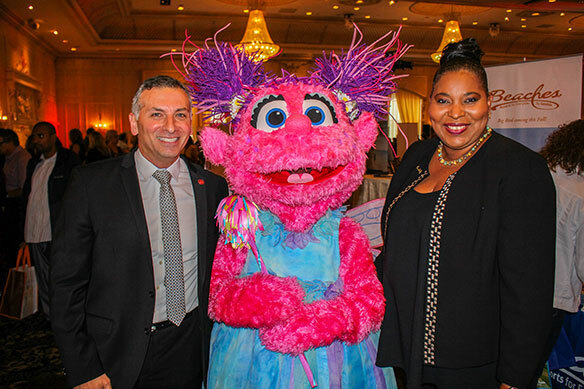 The vibe was electric last Thursday (Sept. 20) as Air Canada Vacations (ACV) held its 2018/2019 Sun Collection launch at the swanky Chateau Le Jardin in Woodbridge, Ont., attracting more than 800 agents and close to 1,000 people in total. Agents were lined up for the 5 p.m. start, which saw them greeted with a brass band welcome. The evening included a large trade show, cocktails and hors d’oeuvres, an impressive dinner spread and, of course, prizes and highlights of ACV’s upcoming winter line-up. The night was topped off with entertainment by mentalist Yan Markson. Speaking with Travel Courier, Nino Montagnese, managing director, Air Canada Vacations, and Dana Gain, senior director, sales, groups and partnerships, stressed the newly re-branded tour operator is all about diversification and customer service. The entire ACV team recently completed Disney Institute training. “The trade today only think of us as Sun. It’s all about diversification and that’s what we want to drive home to all our partners,” said Montagnese, adding agents can also look forward to a new agent web site coming in 2019, as well as lots of new product. The two ACV officials also added that the “new” ACV is also focused on the trade and working close with the travel agent community. As for Sun and the upcoming winter season, ACV’s 2018/2019 Sun Collection features Mexico, the Caribbean, Hawaii, California, Florida and Las Vegas. The Sun Collection boasts more than 700 hotels, most offering all-inclusive packages. It also includes 13 resorts exclusive to Air Canada Vacations, 35 semi-exclusive resorts and more than 100 cruises. Featuring options for short and long stays, additional guided excursions and the new destinations of St. Vincent and the Grenadines, and Belize, the program offers tailored vacation packages. With the services of Air Canada and Air Canada Rouge, ACV continues to offer its customers more destinations and travel options. This winter, ACV offers more capacity with 58 additional new flights to its Sun destinations. Plus, the tour operator is offering savings of $100 per couple all year long when booking a package 90 days prior to departure. Plus, travellers can tie the knot in paradise and receive a $500 flight credit per group for bookings made by Oct. 31. Newlyweds also enjoy additional perks like a complimentary site inspection, free seat selection, two free upgrades, including access to the Maple Leaf lounge, and a $500 future travel credit for their next vacation.